Jon Gruden will forever be remembered for being the head coach who brought a Super Bowl Championship to Tampa Bay. He coached the Tampa Bay Buccaneers to their only Super Bowl victory to date, a 48-21 victory over the Oakland Raiders in 2002. 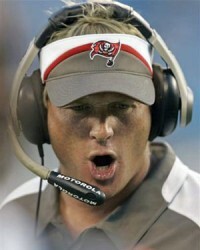 It was the first of seven seasons Gruden would coach at Tampa Bay. Ironically, the team the Bucs beat in Super Bowl XXXVII, the Oakland Raiders, had been the previous coaching stop for Gruden. He had been the head coach in Oakland during the four previous seasons (1998-2001). But it did not matter on which coast Gruden worked the success was off the charts. His Raiders teams captured two division titles and his Bucs teams won three. He compiled a 95-81 overall record as a head coach, including 57-55 in Tampa Bay. He continues to reside in the Tampa area and is a commentator for ESPN’s Monday Night Football coverage. He also has worked a number of Florida Bowl Games for the network, including the Outback Bowl in Tampa and the Discover Orange Bowl in Miami Gardens. Gruden’s brother, Jay, is the current head coach of the Washington Redskins.